Studies bear that out. In 2006, researchers at Yale University found that nearly 80 percent of people believe themselves to be among the top 50 percent on standard tests for emotional intelligence. It’s an example of the phenomenon known to psychologists as the “superiority illusion,” or “Lake Wobegon effect”: An unshakable suspicion held by most of us that, for any particularly positive quality or ability, we rate above average. Essentially, the majority of us will give ourselves at least a 7, for everything. Another tip: Pay attention to those social cues, says Canaday. If you find you’re consistently having the last word before conversation grinds to a halt around you, it might not be due to your showstopping Oscar Wilde wit. 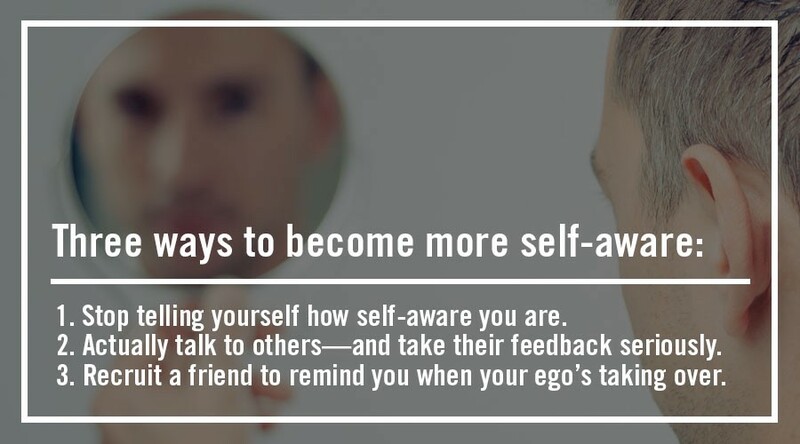 To narrow the gap between how you intend to present yourself and how you actually come across, Canaday also suggests a program of “applied self-awareness.” First, gather as much of an objective view on you as you can; for this you could use standard psychometric tests available online, or submit yourself to a 360-degree assessment from colleagues at work (“You can’t argue with the data, and that’s the kind of thing that moves some people to take action,” says Canaday). With enough persistence, though, the discomfort might just pay off. Been working on your tendency to drop smug historical quotes at the slightest opportunity? Well done, that’s good self-awareness. Give yourself a 7.